For your company to succeed, your API-based product must provide maximal performance and uptime to your customers. In order to provide this, you need to monitor the APIs (both internal and external) that are critical for your product’s customer experience. This series of posts illustrates how you can create a custom automated web site that constantly provides the latest information about API performance for an individual API that’s critical for your product. The first post described How to Use cron and curl to Regularly Download API Performance Data. The second post described How to Use Python to Extract JSON API Performance Data. The third post described How to Use MatPlotLib to Display API Performance Data. In this post, I describe how to bring all of this together in order to create a constantly-updated web page that your entire team, including management, can observe at any moment to review the recent performance of an API. 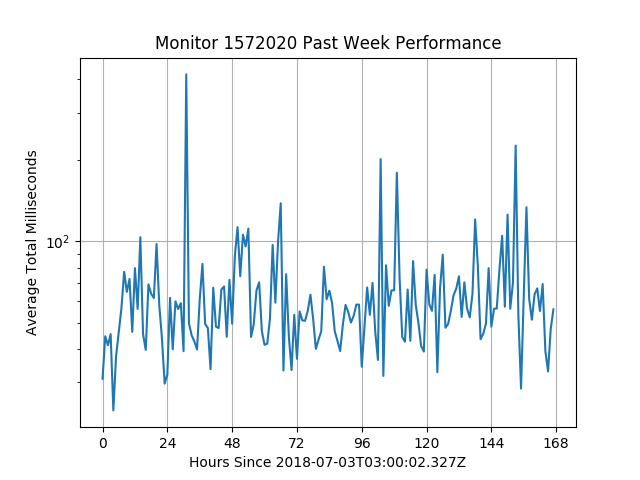 This plot shows the total milliseconds between the monitor’s request sent to the API and the receipt of the response (Y axis) over the past week by hour (X axis). The selected Y scale in the example is logarithmic (this can be edited in MatPlotLib). On this plot, response times above 100 milliseconds are easily identified. That might be a critical performance limit for your application with respect to your customers’ expectations. MatPlotLib provides immense flexibility for you to create plots that will identify critical response issues for your own product. API Monitoring, API Science API, Integrations, JSON, Performance, Teams. permalink.